The previews of AMC's new series Hell on Wheels have convinced a new generation to give the Old West a fair shake. The tortured hero standing on freshly laid track, cigar smoke drifting toward the wilderness would seem a tired cliche, but in HD the landscapes roll lush & seductively dangerous as one might imagine it to have been 150 years ago, and the tattered Confederate veteran wreaks with the pain of revenge. The juxtaposition of beauty and horror is a delicate dance, but intoxicating when crafted with brilliance and the filmmaker's have out done themselves in this regard with Hell on Wheels. One element sadly overlooked would have elevated the footage to perfection: the miles of treeless prairie that set the scene for the original railroad shanty towns where the name Hell on Wheels stuck has a distinctly different feel than the rainy plains of Calgary, Canada (for those of you city slickers, just think of Dances with Wolves and you'll find yourself reminded of how the sun and wind ripples through the prairie). 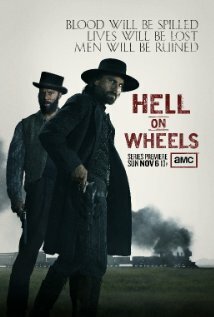 The show's synopsis is simple and straight forward "Hell on Wheels is a contemporary Western that centers on former Confederate soldier Cullen Bohannon, portrayed by Anson Mount, whose quest for vengeance has led him to the Union Pacific Railroad's westward construction of the first transcontinental railroad." As Cullen struggles with his war demons, his dark charisma pulls us into incredibly rich tapestries to meet up with historical characters whose greed, passion, sweat and blood built the Transcontinental Railroad. Thomas Clark Durant, portrayed by Colm Meaney, was the real life railroad tycoon who founded the Missouri & Mississippi Railroad in 1854 and proceeded to make a fortune smuggling contraband cotton from the Confederate States. He invested his ill-gotten gains in a subscription scheme that put him in a position to seize control of the Union Pacific Railroad, naming himself its vice president. From there he swindled his way across the prairie one mile of track at a time until we meet up with him somewhere near what is today North Platte, Nebraska, or as Cullen Bohannon came to know it: Hell on Wheels. I grew up near a prairie train town, and I live today in a train town. The years in between have seen the demise of the miles of network tracks that were built in the late 1800s when trains were the preferred choice of travel (until Henry Ford came up with a better idea). I am here again to see the resurgence of the endless ribbons of freight trains that carry coal from Wyoming to power plants east. Today the mighty Union Pacific connects 23 western states and North Platte's Bailey Yard is the world's largest train yard spanning 2,800 acres. Each day it manages 10,000 railroad cars and sorts 3,000 daily to make sure the cargo reaches its final destination. Hell on Wheels weaves the story of the early history of the railroad seamlessly through Cullen's tale of revenge for the murder of his wife, but the world around him and the characters that he meets are gritty and rich with their own set of demons and baggage. Anson Mount is not afraid to explore his darker side and he is confident enough in his craft to know when to take a step back and allow his fellow actors to tell their character's story. Without his seductive invitation, I doubt most of us would have gotten through the blood and mud of the first episode. Colm Meaney is equally brilliant as the railroad boss and his character is wonderfully faceted. Lily Bell, played well by Dominique McElligott, is too pale and pretty to have wandered in the elements for weeks but we'll forgive her beauty and fine clothes ... its all a part of that cinematic juxtaposition. Christopher Heyerdahl as The Swede and Tom Noonan as Reverend Cole are superb. Elam, played by Common, finds understanding in his struggle beyond Slavery with Eva, a tattooed prostitute, both actors live large in their characters. One by one these bruised souls emerge from desperate situations to reveal a bit of humanity in a cruel wilderness. The last hold out is Cullen, the man who we all hope will reveal a glimpse of his long lost soul ... stay tuned.